As much as you might love reading Bluebird + Blackberries, I love being a part of it even more. Being given a challenge often makes me do or take on something I wouldn’t normally attempt, and at the end of the day I’m always happy for the experience. So when given this Halloween recipe challenge, I knew it was finally time to take on a pumpkin cheese ball. I had seen some different versions on Pinterest, and it made sense to me that these cheese balls would be popular. I mean, to me—plain and simple—there isn't a party without cheese. The problem with a lot of the Pinterest recipes I saw though, is that they were all pretty complicated. They all seemed to include long chilling times and a process that involved somehow wrapping your cheese ball in rubber bands to create indentations. I knew I could find a better way...and I did! This cheese ball is done in only 20 minutes, and you simply shape the ridges of your “pumpkin” with a chopstick or the back of a spoon. Oh, and did I mention that I put sundried tomatoes in my cheese ball and covered it in everything bagel seasoning?! With this recipe in your repertoire, you'll be ready for any Halloween party you might come across! Place the cream cheese, goat cheese, chives, and sundried tomatoes in the bowl of a food processor or mixer, then process to combine until the mixture is smooth. 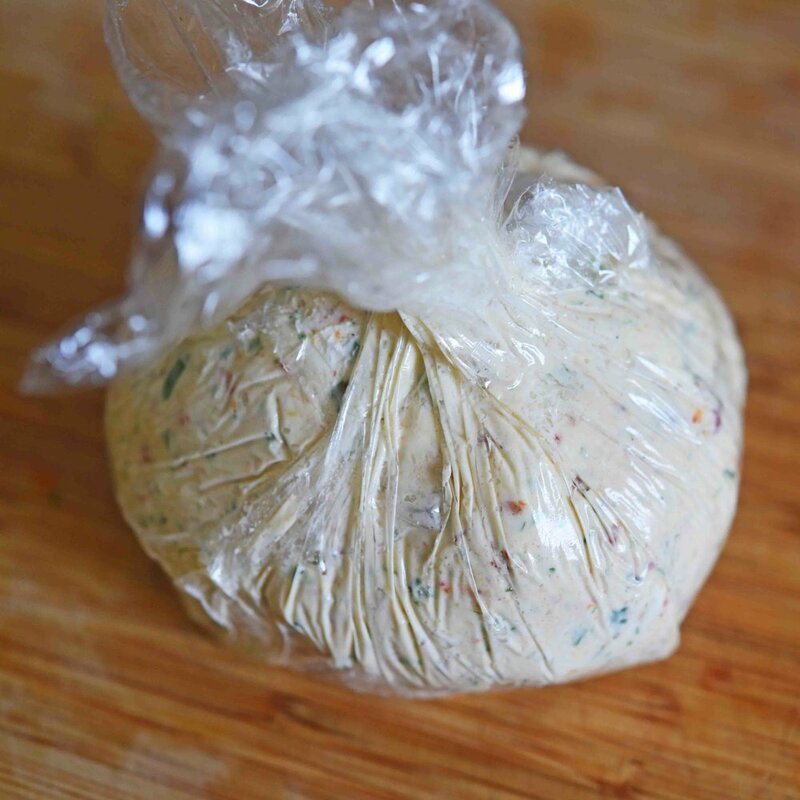 Transfer the cheese mixture to a piece of plastic wrap. Use the plastic along with your hands to form the mixture into a short, squat ball, then place the plastic-wrapped ball in the refrigerator. Remove the stem from the bell pepper or pumpkin; if you use a pumpkin, it’s easiest to cut off the whole top of the pumpkin straight across, then cut around the base of the stem (rather than trying to break the stem off). Remove the cheese ball from the plastic and transfer it to a small plate. Pour/sprinkle the spice mix all over the cheese ball, pressing it in so that it sticks and coats the entire ball. Use a chopstick or spoon handle to press indented lines into the ball that resemble the creases on a pumpkin, then use your hands to smooth and reshape the ball. Insert the stem into the center of the top of the ball. Serve with your favorite crackers, and enjoy! If you’re having difficulty with Steps 4 or 5, try putting your cheese ball back in the refrigerator or freezer to chill longer. It will firm up and may be easier to work with. If you don’t have a pumpkin or bell pepper, you can also use a 2-inch piece of broccoli stem; this also looks great!